The University of Louisville Student Activities Board is hosting Diversity Week in an effort to promote inclusion and to celebrate the diversity the U of L has among faculty and students. From Nov. 4 through Nov. 10 SAB will be hosting multiple events across campus. Kicking off the week is U of L Uncensored, in the SAC Ballroom from 6-8 p.m Nov. 5. A Mile in Their Shoes is a partnered event with the U of L Women’s Center that will take place on Nov. 6 from 6-8 p.m. in the SAC Ballroom. This event will interact with the audience and the tables will highlight prominent people and other women’s issues like the suffrage movement and the pink tax. Tea with Refugees is a panel bringing together a group of refugees in the SAC multi-purpose room from 6-8 p.m. on Nov. 7. The discussion will include aspects of immigration and how U of L is responding to refugee and immigration issues. SAB’s Identity Summit with the Engage Lead Serve Board titled “This is America Part 3” will promote discussion between students of all backgrounds. It will be in Miller IT’s Bigelow Hall from 6-8 p.m. on Nov. 8. Vice provost for diversity and international affairs Mordean Taylor-Archer will be speaking about U of L’s progress and plans in terms of campus diversity. Dinner will be provided by Ramsi’s Cafe. The Floyd Theater will be showing Crazy Rich Asians and BlacKKKlansman as a part of Hues in Hollywood on Nov. 9, with showtimes at 5 and 8 p.m. This will be accompanied with a panel of members from the Black Student Union and the Vietnamese Student Association to discuss the importance of minority representation in lead roles in Hollywood. 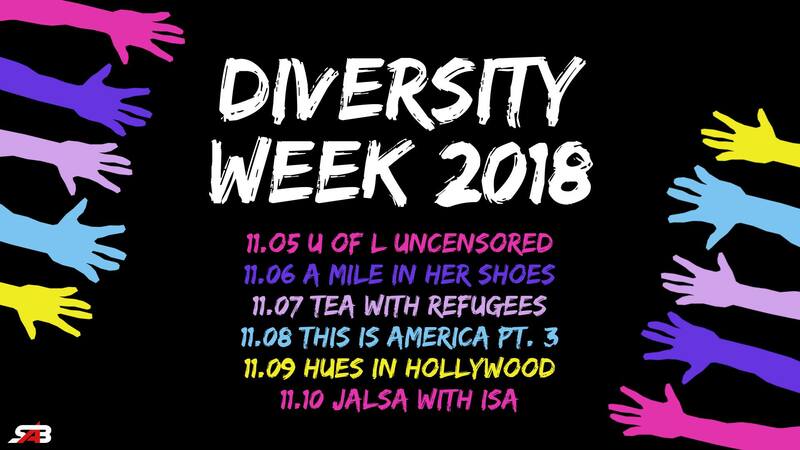 Diversity week’s final event will be Jalsa, in the SAC Ballroom on Nov. 10 from 6 to 10 p.m. This event is $5 for students and $10 for the public. It is an annual event featuring Diwali, the Indian festival of lights. The Indian Student Association is providing food, cultural performances and a skit. More information can be found on the Student Activities Board’s website.